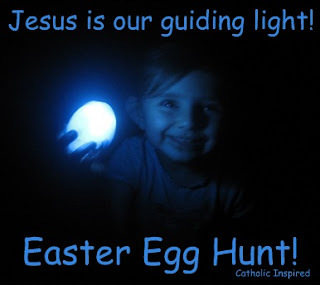 Home » Easter » Jesus is our Guiding Light ~ Easter Egg Hunt! I'm posting this so you'll have plenty of time to prepare for future Easter Egg Hunts! But keep in mind it's still the Eastertide so feel free to have an egg hunt even though Resurrection day has past! My family had two Easter Egg hunts this past Resurrection day! But the second one was a HUGE hit!! 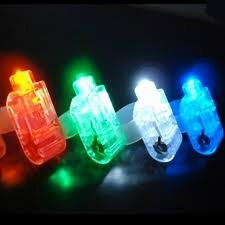 We held it at night in complete darkness! The only lights that were on were the lights in the eggs! We told the kids that the glowing eggs are a symbol of Jesus as our guiding light and our Salvation! To make the eggs glow we added finger lights. We hid our glowing eggs inside the house: in cabinets, under couch pillows, behind curtains and anywhere the light would only shine a little. The tiny amount of glowing light helped the kids as they searched for the eggs, but when they opened the cabinet doors or lifted the pillows the eggs would glow with a radiant light! Our kids were allowed to keep one of the lights and an egg; the rest of the lights were saved so we could hide them in the eggs again next Easter! The kids had a super fun time!! And it was even fun for my teens! They are all looking forward to next year's night-time easter egg hunt!! May God bless the rest of your Easter season! I love this idea! We will definitely do it next year...perhaps even this year, yet! Thanks for sharing! What a marvelous idea! I'm thinking about adapting it somehow to use sometime during Eastertide, since I don't want to wait until next year to do it! Thanks so much, happymomonline and Cheryl! Hope you all enjoy it! God Bless!